Oh my word, how come I never read this book before now? Everyone says this is such a sad story. If you don’t know any better, it has the requisite ups and bottom of the barrel depths of despair before the main character climbs back up again. 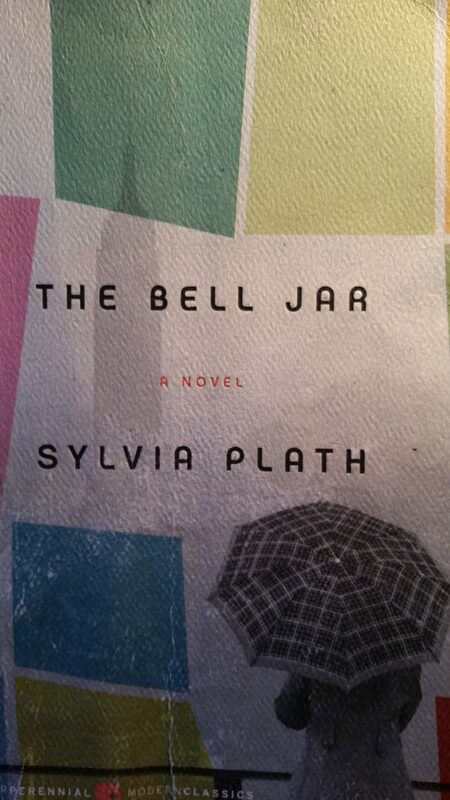 Here’s what makes it sad: The story is (loosely – although parts don’t sound that loose) based on Plath’s life. Plath committed suicide, so when you read it and know that outcome you know the main character didn’t fully make it out of the dark depths. That is where the story is heart-breaking. The story is told in the first person present and past tense. I realized we kept piling up these presents because it was as good as free advertising for the firms involved, but I couldn’t be cynical. I got such a kick out of all those free gifts showering onto us. For a long time afterward I hid them away, but later, when I was all right again, I brought them out, and I still have them around the house. I use the lipsticks now and then, and last week I cut the plastic starfish off the sunglasses case for the baby to play with. One sentence and yet, there is so much buried in it, how can you not want to know more? I’d never known a girl like Doreen before. Doreen came from a society girl’s college down South and had bright white hair standing out in a cotton candy fluff round her head and blue eyes like transparent agate marbles, hard and polished and just about indestructible, and a mouth set in a sort of perpetual sneer. I don’t mean a nasty sneer, but an amused, mysterious sneer, as if all the people around her were pretty silly and she could tell some good jokes on them if she wanted to. So summed up, this is the first person writing that makes me swoon. Don’t get me wrong, it doesn’t have to be literary, it just has to put me there and make me feel like I am the MC. But it has to do so with the finesse of trust that, I, as the reader understand the situation with a play-by-play run down. A fun link: The Barbizon Hotel – this is a story on the hotel featured in the beginning of the story and also featured in a part of Ms. Plath’s life. How do you feel about the first person point of view in this story?